Sony A7 II: 400mm (400mm equiv. ), f/5.6, 1/640s, ISO 800. Click for full-res image. Click here for the RAW file. The Sony FE 100-400mm f/4.5-5.6 GM OSS lens is the longest lens in Sony's ever-expanding mirrorless lens lineup. The telephoto zoom occupies a distinct role in Sony's G Master lineup and was announced alongside the Sony A9 camera, which makes perfect sense given that camera's emphasis on speed and the 100-400mm lens' excellent capabilities for fast-paced situations. Not only is the new 100-400mm GM zoom the longest lens in the G Master lineup for Sony, it is also the longest full-frame lens Sony makes for their E-mount (Sony has a 300mm f/2.8 and a 500mm f/4 lens available for A-mount in addition to a 70-300mm A-mount zoom lens). This lens will be of particular interest to sports and wildlife photographers. The Sony FE 100-400mm f/4.5-5.6 GM OSS lens has a very robust construction. The lens is dust and moisture resistant and feels like a professional optic. The lens is fairly heavy, but it is very manageable, especially for photographers accustomed to long prime lenses. The 100-400mm GM weighs 49.3 ounces (1,395 grams) without the tripod mount attached. The lens is just over 8 inches long (205 millimeters) and has a maximum diameter of 3.7 inches (93.9 millimeters). The filter thread is 77mm. I'd like to point out that the lens hood is excellent. Not only does it fit nicely onto the end of the lens, but it has a sliding door that allows you to reach in and rotate a polarizer without removing the hood, which is a nice touch and good attention to detail. When paired with a Sony A7 II body, the lens balances quite nicely. On a smaller A6500 body, the lens looks very large, and its weight paired with the smaller size of the APS-C camera makes for a front-heavy combination. Regarding the tripod foot, it is rugged and sturdy. The tripod collar can be rotated, which is nice, and the foot itself can be removed -- although it can be quite tough to remove. The lens has a nice textured light gray finish, reminiscent of Sony's 70-200mm f/2.8 G Master lens. The model name is raised on the barrel of the lens but all other markings are painted on rather than engraved. The ring closest to the camera body is the zoom ring, which is plenty wide and has a good grip on it. The zoom ring's tension can be adjusted using a ridged ring between the zoom ring and the camera body. The tension ranges from "Smooth" to "Tight," and I found myself opting for something roughly in the middle. At the "Smooth" end of the spectrum, the lens will creep when you have the camera tilted forward, which I don't like. There is no switch to lock the zoom at 100mm for traveling, but if you set the tension ring all the way to "Tight," it'd be hard-pressed to extend when in storage. The focus ring is near the end of the lens barrel and is slightly narrower than the zoom ring. The focus ring rotates smoothly, and in my opinion, maybe too smoothly because it feels somewhat loose. It is difficult to make very precise manual focus adjustments with the 100-400mm lens, although it is not a lens I would expect many users to use with manual focus, so it's not a big issue. There are four switches on the lens which control AF/MF, focus range, Optical Steady Shot On/Off and OSS mode (there are two options). In addition, there are three focus hold buttons on the barrel between the zoom and focus rings. The buttons are a good size and are conveniently located for both shooting in landscape or portrait orientation. 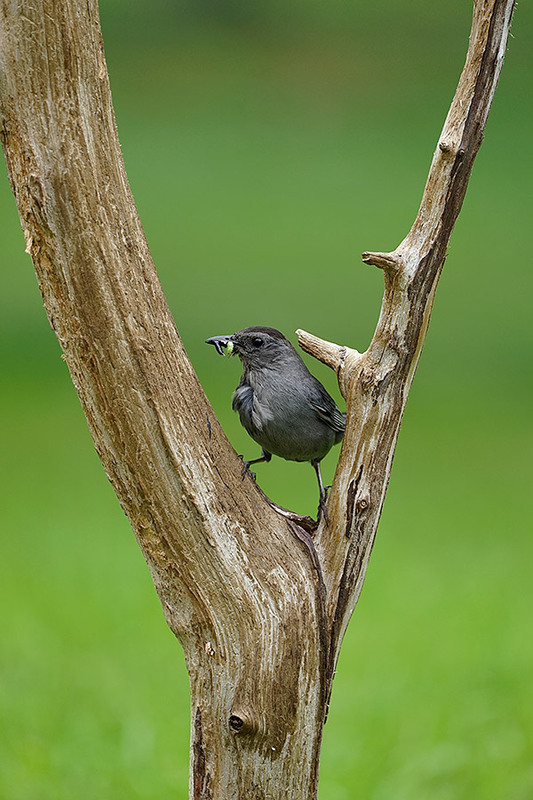 Overall, the Sony 100-400mm lens has a great build quality and feels very good in real-world use. The lens is large, but not too heavy to comfortably use for extended periods of time. Its build quality absolutely lives up to the G Master moniker. 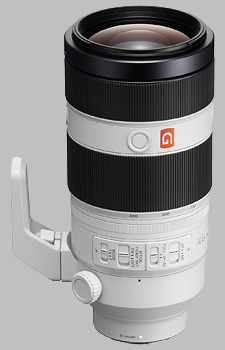 As part of Sony's G Master series, the new 100-400mm zoom lens is required to have high optical quality. After all, it's a pro-oriented lens. To that end, it includes 22 elements across 16 groups, including 2 extra-low dispersion and a single Super ED element. The lens also includes Nano AR coating and a fluorine coating on the front element (for extra protection and easier cleaning). Let's find out if all this glass and the "GM" billing results in great optical quality. Sony A7 II: 400mm (400mm equiv. ), f/5.6, 1/640s, ISO 640. 100% crop. Click for full-size image. Click here for the RAW file. I'm happy to report that this lens is very deserving of being included in Sony's high-end G Master lens lineup. All those elements and coatings result in fantastic sharpness across the entire zoom range. Even at 400mm and on a full-frame camera, the Sony 100-400mm f/4.5-5.6 delivers high sharpness across the frame. I'm used to telephoto zoom lenses compromising on image quality for the sake of versatility, affordability and usability. There are no such compromises made with the G Master telephoto zoom. At 100mm, the Sony FE 100-400mm f/4.5-5.6 GM OSS is sharp across the entire frame. In the two shots below, the first a center crop and the second a corner crop. You can see that even when shooting wide open at 100mm, the lens delivers very good performance on the full-frame Sony A7 II. Sony A7 II: 100mm (100mm equiv. ), f/4.5, 1/640s, ISO 100. 100% crop from the center of an unedited JPEG image shot with the above camera settings. Click for original image. Click here for the RAW file. 100% crop from the top right corner of an unedited JPEG image shot with the above camera settings. Click for original image. Click here for the RAW file. At 400mm, the lens remains very impressive, even when shooting wide open. In the shots below, you can see that when shooting a distant or close subject, the Sony 100-400mm G Master lens delivers very sharp results in the center and even in the corners, although corner sharpness does drop off more at 400mm than it does at 100mm. Sony A7 II: 400mm (400mm equiv. ), f/5.6, 1/500s, ISO 100. 100% crop from the top left corner of an unedited JPEG image shot with the above camera settings. Click for original image. Click here for the RAW file. Sony A7 II: 400mm (400mm equiv. ), f/5.6, 1/125s, ISO 100. No matter what focal length you shoot at, full frame or crop sensor, the Sony 100-400mm f/4.5-5.6 GM OSS lens delivers very good performance for a powerful zoom lens. All else equal, a zoom lens generally will not deliver the same optical performance as a prime lens, but with this single optic, you can capture sharp shots from 100mm to 400mm. That is a good amount of reach, as you can see in the comparison shot below. This comparison shows the zoom range of the Sony 100-400mm G Master lens on the Sony A7 II. Even on the full-frame Sony A7 II, the 100-400mm G Master lens showed very little vignetting. I noticed slightly more darkening toward the edges at 100mm than at 400mm, but in both a test scene and in real-world shooting, vignetting is barely an issue. The falloff performance here is excellent, even when shooting wide open. Sony A7 II: 100mm (100mm equiv. ), f/4.5, 1/640s, ISO 100, +1.33 EV. Sony A7 II: 400mm (400mm equiv. ), f/5.6, 1/320s, ISO 100, +1.33 EV. The Sony FE 100-400mm does a good job handling chromatic aberration overall during real-world shooting. While there is some CA visible in test shots, as can be seen below, in real-world use not many subjects caused issues. The exception to this was photographing loons, where some chromatic aberration and purple fringing can be seen around certain edges. This isn't unusual as loons are particularly challenging subjects in numerous ways. Chromatic Aberration Test. Sony A6500. These are from RAW files processed with Adobe Camera Raw defaults and no additional lens corrections applied. You could correct this chromatic aberration without much difficulty, but I wanted to show how the lens does in its worst-case scenario. Click here for the 100mm image and here for the 400mm image. RAW files are here: 100mm and 400mm. Sony A6500: 250mm (375mm equiv. ), f/5.6, 1/500s, ISO 250. 100% crop of the above modified image showing some purple fringing around the high contrast details. Click for original image. Click here for the RAW file. When considering flare, the 100-400mm GM lens continues to impress. You have to go out of your way to introduce much lens flare. Even in the example shots below, with the sun barely out of the frame, it was not easy to get lens flare. Sony A6500: 107mm (160mm equiv. ), f/14, 1/400s, ISO 100. Notice the tiny bit of lens flare in the bottom right corner. The sun was just outside the frame. Click for original image. Click here for the RAW file. Sony A6500: 100mm (150mm equiv. ), f/8, 1/160s, ISO 100. The sun was just outside the frame and pointing right toward the lens, but the image has good contrast and barely, if any, lens flare is present. Click for original image. Click here for the RAW file. Sony A6500: 400mm (600mm equiv. ), f/8, 1/500s, ISO 160. The sun was just outside the frame and pointing right toward the lens but the image has good contrast and doesn't have lens flare. Click for original image. Click here for the RAW file. For a $2,500 100-400mm zoom lens, I am very impressed by the Sony 100-400mm G Master lens. Even when shooting with a full-frame camera body, the new Sony 100-400mm f/4.5-5.6 GM OSS lens is very sharp across the frame no matter which focal length you shoot at. Some long zoom lenses need to be stopped down to deliver the best performance, but that is not the case with this new lens from Sony. Its optical quality lives up to its "G Master" namesake. In the field, the Sony FE 100-400mm f/4.5-5.6 GM OSS handles very well. I've discussed its build quality and optical performance extensively, but another aspect of the lens that is critically important is its autofocus performance. The lens has a floating focus mechanism driven by a combination of a double linear motor and Direct Drive SSM (DDSSM). All the technical lingo aside, this first-of-its-kind autofocus system delivers fast, accurate AF performance across the focal length range. Sony A7 II: 339mm (339mm equiv. ), f/5.6, 1/640s, ISO 250. On the full-frame Sony A7 II, the 100-400mm focused quickly, with its only weakness being at or around 400mm -- the lens was sometimes hesitant to refocus on a very close subject, forcing me to manually override it to help it along. This didn't happen often and only was an issue when near the close-focus limit (more on that in the next section). On the crop sensor A6500, the 100-400mm lens was not quite as fast to lock focus, but it was still speedy. Sony A6500: 333mm (499mm equiv. ), f/5.6, 1/640s, ISO 500. It can be difficult to make direct comparisons across lenses from different manufacturers given how important the camera body itself can be -- but I expect the 100-400mm is even better on the new Sony A9 than it is on the A7 II -- and I would say that the GM 100-400mm lens focuses as quickly or quicker than the Canon 100-400mm lens and faster than the Nikon 200-500mm lens. Another perk of the lens is its focus hold buttons, which work well and make focus and recompose situations easy. They're also useful when I was waiting for birds to appear so that I wouldn't accidentally touch the shutter and trigger a focus adjustment while waiting to capture shots. The Sony 100-400mm GM OSS lens has very impressive close focus capabilities, although as I mentioned above the focus speeds can decrease at the extremes. The close focus distance of the lens is 3.22 feet (0.98 meters), which results in a maximum magnification of 0.35x and a max magnification ratio of 1:2.86. 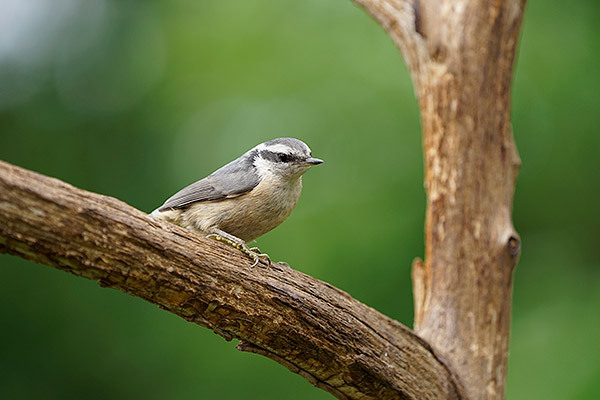 This is very good for a long zoom lens and allowed me to shoot nice images not only of small birds from a blind but also of flowers and other still life. Sony A7 II: 100mm (100mm equiv. ), f/4.5, 1/500s, ISO 500. Close focus test image. Click for original image. Click here for the RAW file. Sony A7 II: 400mm (400mm equiv. ), f/5.6, 1/500s, ISO 800. Sony A6500: 100mm (150mm equiv. ), f/4.5, 1/800s, ISO 500. Sony A6500: 400mm (600mm equiv. ), f/5.6, 1/800s, ISO 800. The Sony FE 100-400mm f/4.5-5.6 GM OSS lens impresses across the board, from its build quality, image quality and autofocus performance. No lens is perfect though, and an area where I occasionally felt the 100-400mm f/4.5-5.6 to be wanting is with regard to its low-light performance. When shooting from around 160mm to 400mm, the maximum aperture is f/5.6 and that can be limiting when photographing moving subjects in low light. This is a great lens for wildlife, but it must be paired with a camera that performs well at high ISOs. Many shots I captured were at ISO 3200 and higher. As camera's high ISO performance continues to improve, I suspect that we will see a continued shift toward versatile, lightweight long zoom lenses rather than the heavy, expensive fast exotic prime telephoto lenses you see many professional sports and wildlife shooters using. The optical quality is there with the new Sony 100-400mm lens, to be sure, but I was occasionally left yearning for a faster aperture, not only for dealing with low light situations but also for creating better subject separation from the background. At the end of the day, there is no lens that will excel in every situation, but this telephoto zoom lens gives sports and wildlife shooters in particular a fighting chance in nearly every scenario. I've included a selection of some of my favorite shots captured with the Sony FE 100-400mm f/4.5-5.6 GM OSS lens below. Sony A6500: 400mm (600mm equiv. ), f/5.6, 1/800s, ISO 2000. Sony A7 II: 400mm (400mm equiv. ), f/5.6, 1/250s, ISO 160. 100% crop inset. Click for original image. Click here for the RAW file. This image has been cropped. Click for original image. Click here for the RAW file. Sony A7 II: 400mm (400mm equiv. ), f/5.6, 1/640s, ISO 500. Sony A7 II: 291mm (291mm equiv. ), f/5.6, 1/640s, ISO 250. Sony A7 II: 388mm (388mm equiv. ), f/5.6, 1/640s, ISO 400. Sony A7 II: 400mm (400mm equiv. ), f/5.6, 1/250s, ISO 2000. While the performance of a zoom lens won't match a similar prime lens, all else equal, the Sony 100-400mm G Master lens is still incredibly sharp and performs very well. Considering its versatility, build quality, optical quality and price, the Sony 100-400mm GM is a home run and deserves a place in the kit of every Sony E mount shooter in need of telephoto reach. Granted, it is still $2,500 and that is a lot of money, but if you can afford this lens, buy it. (From Sony lens literature) Sony Electronics, a worldwide leader in digital imaging and the world's largest image sensor manufacturer, has today introduced their furthest reaching E-mount lens, the FE 100-400mm F4.5--5.6 GM OSS Super Telephoto Zoom (model SEL100400GM). Functionally, the lens has a zoom torque adjustment ring -- a first for Sony α -- allowing the user to adjust the level of torque in the ring to zoom faster or slower depending on their shooting style. There is also a focus hold button that can also be assigned to variety of functions including focus mode selection, AF area selection or the popular Eye AF lock feature. The Sony FE 100-400mm f/4.5-5.6 GM OSS SEL100400GM doesn't have any user reviews yet!